Exodus 20:12 Honor your father and your mother, that your days may be long in the land that the LORD your God is giving you. As time passes, some of us come to the point in our lives where we are mothering our own moms. Medical issues can ravage the body too soon, or with the natural aging process, we are required to step up, sometimes when we ourselves are mothering youngsters. My mother and I were blessed to have a very close relationship. When my mom was diagnosed with Parkinson’s disease, she faced a slow but sure decline. As her disease progressed, along with the anxiety and mental issues that can go along with this disease, I began to see a role reversal in mothering. But wait…..I didn’t want this. I didn’t ask for this. Although Mom did not physically live under our roof with my family, I did orchestrate her care and made regular visits, while simultaneously taking over her finances (she was none too thrilled about that one! ), coordinating doctors, refereeing conflicts between caregivers, and receiving phone calls at all hours. During my visits, it was as if she were drowning and reaching out to me to help her, to pull her up out of the water. I prayed. And I prayed. And I prayed some more. I told God I just wanted to glorify Him in my relationship with Mom, to show her Jesus; to reflect His love and compassion. God WAS there, helping me. I see that now. The mother-child relationship reminds me of our relationship with our Father in Heaven because HE FIRST LOVED US. Why do we love God? Because He first loved us. Moms love their babies first. We in turn develop a deep love for our Moms. 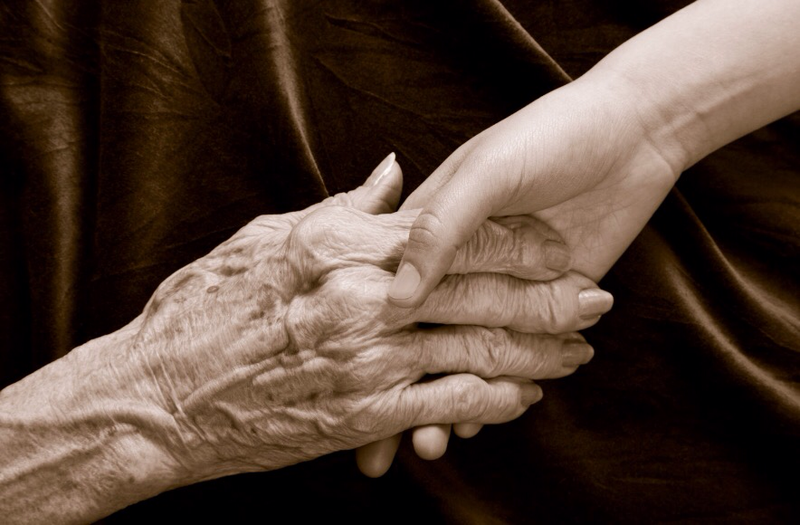 As we take care of ailing parents, we will need God’s help, which He so freely gives. If you are caring for your elderly mother, I pray that you will enjoy the time you have with her, cherish the special moments that God gives you. The day will come when she will no longer be here on earth with you. I would give anything for the PRIVILEGE of taking care of my mom … for just one more day. She loved YOU FIRST. Now it’s your turn. Jackie is a wife and mother of two, living in Southern California. She is an Avon Lady and volunteer sound technician at her church. Her interests include yoga, fitness and nutrition, and her Happy Places are the beach and the mountains. Jackie and I met at the TaeKwonDo studio where our sons (ages 4 and 5 at the time) were students of the skillful art; her son (oldest child) and my youngest son have just graduated from college ~~ so that gives you insight to how long I’ve known this gorgeous woman of God. As far as I can remember, Jackie has always been the devoted and loyal friend, willing to lend a hand wherever and whenever she could. We’ve laughed and cried and sometimes laughed so hard that we cried! In Jackie’s company, I’ve always found a “comfy spot” to just lean back and at times lean on ~~ genuine Girlfriends are like that! Jackie……Thank you for being obedient to the calling that God has on your life with your mother. We all make plans for our own lives then woopsey daisy, here comes God with His plans. His AMAZING plans, His unthinkable plans that He has. By the end of your story, I could feel your weight lifting off your shoulders as you settle into God’s plan. THANK YOU…..you are an example for us all. I struggled for many years with this calling from God, and I wish I knew then what I know now… God is helping me with my regrets, and part of this process has been writing about it. Thank you so much for your encouragement, Christy! After a long road of caring for both of my parents, I lost both of them this year. These feelings Jackie wrote about so beautifully are still very fresh for me. We have such an amazing God. He strengthens us and equips us to do things we never thought we could do. Looking back I too can see that God was always there. And I can be thankful for time spent with my mom and dad and also for how He changed me through all of it. My heart beats for you, Girlfriend … Both of my parents are in that Season of Life where they need 24/7 home care. My father was recently in a nursing rehab facility. My mother having made several hospital ER visits in the first quarter of this year. I hear you … More so, I FEEL you … This article ministered to me too. Jackie ~~ I’m going to be very transparent here (just as I am with you on a personal level) ~~ only God would “time” the publishing of this article ~~ on the eve of my father’s release from the nursing rehab facility where he has spent the recent 100-days. He went home to be greeted by the full-time caregiver that has been with my mother for the same length of time. Like Krista, it’s a LOOONG road when there’s TWO parents in the same “season” of life. 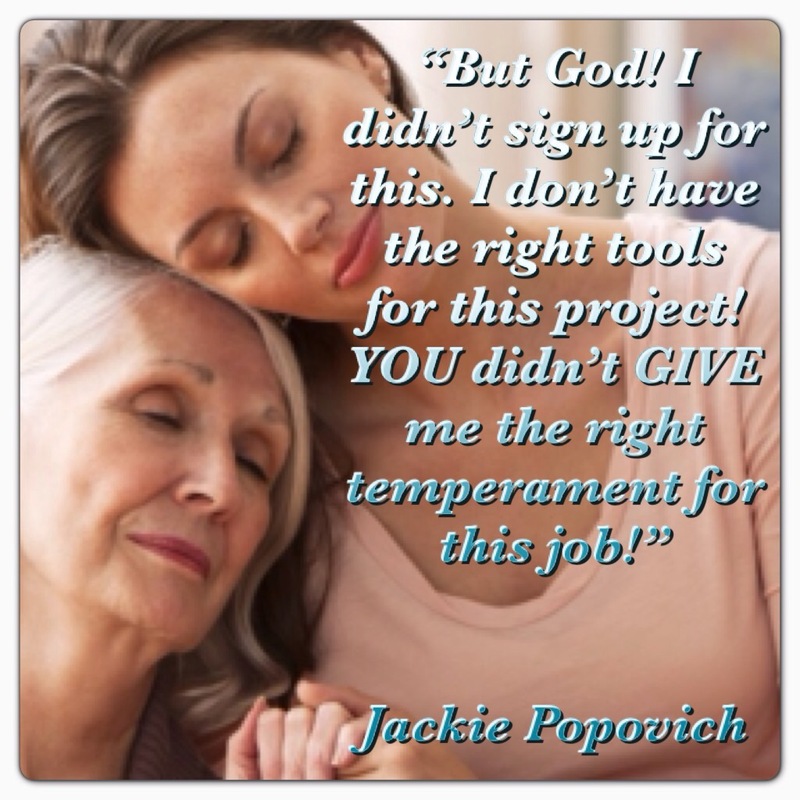 Your personal experience has given me a fresh perspective on many things ~~ you KNOW where I’m coming from ~~ and I THANK YOU from the bottom of my heart, Jackie ~~ which is where God has softened and filled to overflowing with His Love and compassion. I will be calling on you A LOT ~~ I hope you don’t mind! PS you know I am always here for you! Beautiful tribute to our relationship with God! Thanks for the reminder to cherish time spent with my mom! Thank you for responding, Chris. I know you have a great relationship with your mom and it makes me happy that you enjoy each other so much. She is a blessing, as are you. Thank you so much for pouring out your heart and sharing the journey the Lord has had you on. God is so amazing as He takes you step by step! I too had a simular experience with my Dad, from the time he was diagnosed with cancer to the time he went to be with the Lord was a little over a year, and I can truly say that if was the most wonderful and beautiful year of our lives. The Lord was so incredibly faithful to meet me…us right where we were. The moment he was diagnosed my first prayer was for his salvation, oh how I prayed. He shared with me on Thanksgiving day that he had accepted the Lord and went to be with his Heavenly Father two weeks later!